James Howe, 2001. This delightful novel follows the exploits of four seventh-grade outcasts: Addie, the tall nerdy one; Skeezie, a rather uncouth and unclean kid; Bobby, fat and happy; and Joe, proudly gay. They decide to enter a third-party slate for student council, based on an anti-name-calling platform, and, well, they don’t win, but they Learn a Lot and all that. They even learn about the problems with white do-gooders trying to address racism without involving any actual black people, which is pretty advanced for a middle-grade novel, and pretty awesome. Joe is a happy, well-adjusted kid who likes boys, and he even gets a boyfriend in the book. I don’t know how realistic that is; I knew gay kids in seventh grade, but I didn’t know any out-of-the-closet couples. Of course that was 1989. Still, this is one of those feel-good books, like Boy Meets Boy, that seems destined to be a classic. Yay. This entry was posted in 2001, asian american, black, fat, gay male, James Howe, middle school, realistic, secondary queer character. Bookmark the permalink. 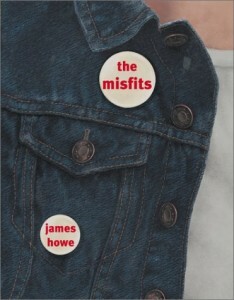 Oh yay, The Misfits! I liked this one even more when I found out it was by the same James Howe who wrote Bunnicula. The sequel, Totally Joe, is also excellent!